Welcome to our "Download Specials" page. Downloads are becoming more and more popular because of the speed and low cost. David and Jess are filming special lessons each week that will only be released here on this special page. 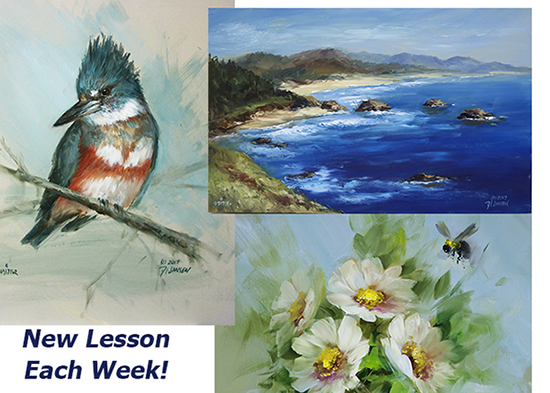 Each lesson is a full video presentation and also features a full color photo of the finished painting and pattern where needed. Some lesson feature "sketching" lessons which help you develop your artistic skills. Need something to paint this weekend? Look here for our weekly specials and downloads. Simple, and convenient. Choose your lesson, download it immediately and begin your painting. No waiting, shipping and added charges. Just choose and paint! Check back often as we add new lessons. These videos are in MP4 format and play on all computers and DVD systems.